Throughout the last six months, trainer “Buff” Bradley and owner Carl Hurst have spent thousands of dollars rehabbing their “pride and joy” The Player after he suffered a near-fatal injury in late March. The colt finally returned to Bradley's farm on Friday and, in a true fairytale ending, Bradley and Hurst were rewarded Saturday when their 51-1 longshot Divine Queen scored a shocking victory under Hall of Fame jockey Calvin Borel in the $100,000 Dogwood (Listed) at Churchill Downs. Divine Queen, a homebred by Divine Park out of Bradley and Hurst's stakes-winning mare Town Queen, was the longest-priced horse in the race. 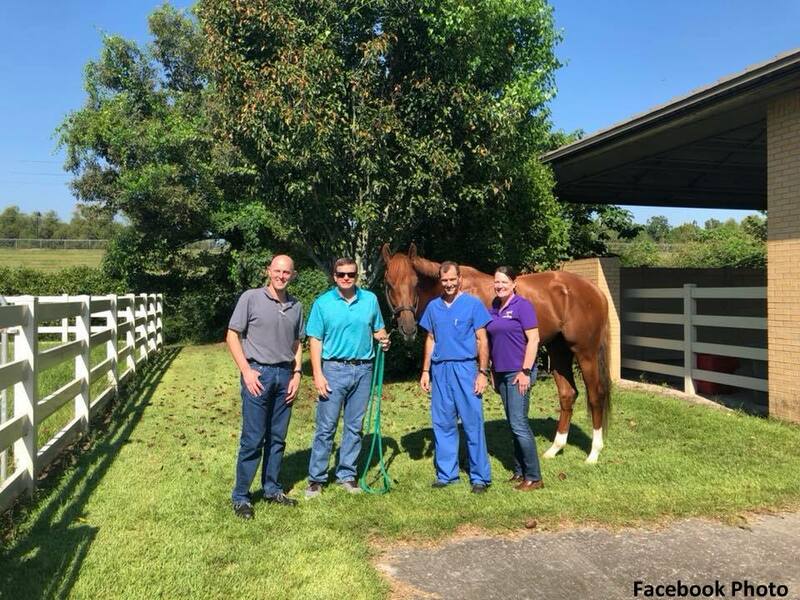 The Player spent nearly six months at the LSU clinic recovering and rehabbing until he was stable enough to make the van ride back to Bradley's Indian Ridge Farm in Frankfort, Ky.
Bradley traveled Thursday to pick up The Player and made a nearly 24-hour trip back to his family's farm. Fans can track The Player's progress through his Facebook page: https://bit.ly/2I9YvuP. Bradley hopes to have an open house at his farm in the upcoming months. This entry was posted in NL List, People and tagged Buff Bradley, Calvin Borel, carl hurst, churchill downs, divine park, divine queen, Dogwood, Dogwood Stakes, the player by Press Release. Bookmark the permalink.